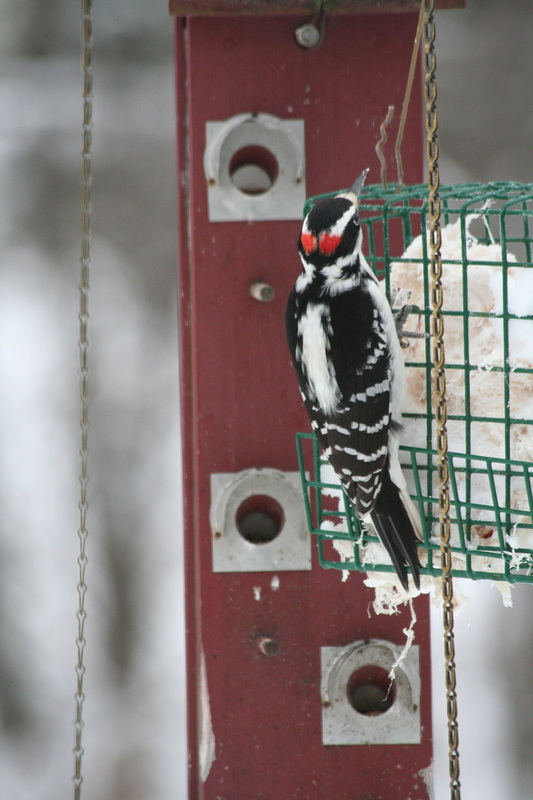 Lucy Quimby shared this shot of a male Hairy Woodpecker getting ready to eat some suet. The photo clearly shows the white back detail that this species has and shares with another woodpecker found in this area, the Downy Woodpecker. Hairy woodpeckers are a larger bird than Downy - 9 1/2 inches compared to Downy's 6 1/2. The Hairy has a larger beak than the Downy and clean white tail feathers. The voice and call of these two woodpeckers are different too. It's fun to learn the differences in their calls. The birds can be quite vocal but are sometimes too far away to see. From my experiences, they like to hide on the opposite side of tree trunks. Hearing a sharp peek! always satisfies my curiosity.